Fura Bloodmouth is a Nord warrior and vampire in Volkihar Keep. She is a master trainer of Two-handed. Fura wears a set of light gray colored vampire armor with a matching pair of boots. She is equipped with a leveled one-handed weapon which can be up to elven quality. She carries random leveled bandit loot, and has a 25% chance of carrying 1-9 gold. If your Two-handed skill is less than 90, when asked for training she will say: "I can crush skulls with the best of them. Let me show you a few things." If your Two-handed skill is 90 or above, she will not be able to train you more and will say: "You're pretty good. I don't think there's anything more you can learn from me." When asking Fura about who the Dawnguard are, she will say: "A more "serious" group of the Vigilants of Stendarr. Sometimes when you skin a skeever, you find he has a more aggressive mate. The Dawnguard apparently like killing vampires. Almost as much as we like killing them." When asking how she serves Lord Harkon, Fura will say: "Simple. He says 'kill', I kill. Sometimes he doesn't even have to say it." She may greet you by saying: "I don't converse with my meals." if you are not a vampire. If you are, she may say "I wish Orthjolf and Vingalmo would just get it over with and kill each other. I'm tired of listening to them." In combat, Fura may use taunts such as: "I'm going to rend you limb from limb!" or "Every last drop of your blood is mine!" "You've no chance against a true vampire!" When asking what you can do to help, Fura will say: "A bunch of feral vampires are running wild, upsetting the mortals. When the prey is riled, it makes things difficult for us. Go cull the brutish beasts before the problem gets out of hand." Upon return, when you tell Fura that the thin-blooded vampires are dead, she will say: "Good job. At first you may pity the thin-bloods. But after disposing of a few, you realize they aren't worth the worry." When asking what you can do to help, Fura will say: "The Dawnguard will want the Bow, and they will fight us, hard, to get it. We should strike them first before they can muster a larger force. But their time has come to an end. And you will be the one that ends it." You can then tell her you have understood, and Fura will say: "Good. They've holed up in an abandoned fort in the Reach [sic]. Kill their leaders. That should put a stop to a full out war." 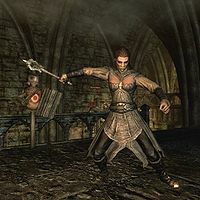 Upon return and telling Fura you have killed the Dawnguard leaders, she will say: "Good. That should slow them down. But, we haven't gotten rid of them completely. A body can rattle around confused long after it's head's been severed." When asking what you can do to help, Fura will say: "A feral-blooded has holed up with a group of bandits. Likely wants to create a nest of broodlings." OR "A feral-blooded has holed up with a group of necromancers. Likely wants to create a nest of broodlings. We don't need competition for blood, and we don't want the mortals getting up in arms making things difficult for us. Go destroy the feral beast before this becomes a problem." Upon returning and telling Fura the feral vampire is dead, she will say: "Good work. It's always best to deal with a problem by ripping it out at the root." When asking what you can do to help, Fura will say: "You're going to go kill a Dawnguard spy. But don't draw attention. Some kills are for fun, some for profit. And others are for sending messages. This one is a message. With any luck he'll bleed to death before anyone notices. A cold corpse will say what we want better than a warm one." You can then ask her what she means by discreet, to which Fura will respond by saying: "What do you think I mean? Don't make a big scene. Don't get caught. The corpse is to be the message, not the attack." You can then tell her that you have understood, and Fura will say: "Good." Upon returning, you can tell Fura you have killed the person masquerading. If it was discreet, Fura will say: "Well done. Nothing like a good kill to get the blood pumping, is there?" If you were not discreet, she will instead say: "Apparently you had blood in your ears when I said not to draw attention to yourself. If I wanted a messy kill I would have said so. But a kill is a kill, and it'll send a message to the Dawnguard, if not exactly the one we wanted." Her head can be looking down, and won't move. This page was last modified on 4 September 2018, at 00:00.